I can just imagine your reaction when you read the title of this post. I don’t blame you if you think I might have completely lost my mind. I had the same reaction when I saw this recipe in The Eggplant Cookbook when I got it a few years back while browsing through books at the UCLA Book Festival. I have to be honest, the recipe intrigued me. The opportunity came to give it a try and be adventurous when I attended a eggplant themed lunch earlier this month. So I went to work and I was pleasantly surprised at how good the ice cream was and at how well it was received. It is safe to say that there were no leftovers. That’s always a good sign in my book. 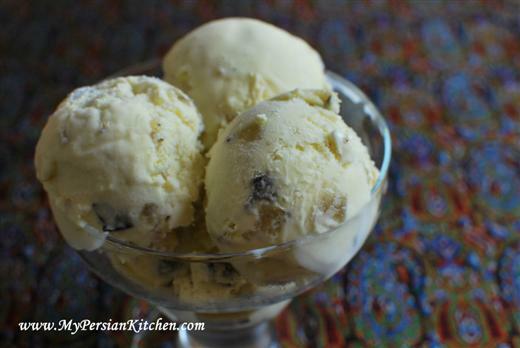 When I posted that I had made eggplant ice cream on My Persian Kitchen’s fan page, it created a bit of a buzz and I was asked by a couple of people if I would post the recipe. I made it again last week and took pictures along the way. I slightly tweaked the original recipe for the better! 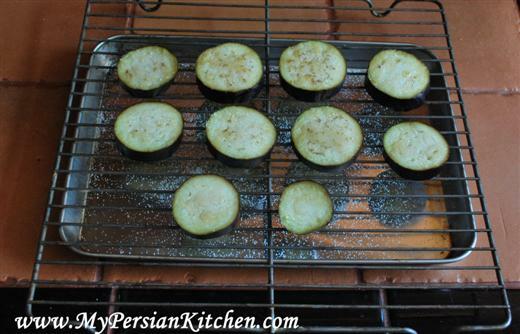 Sprinkle eggplant slices with a generous amount of sugar and let stand for about one hour. 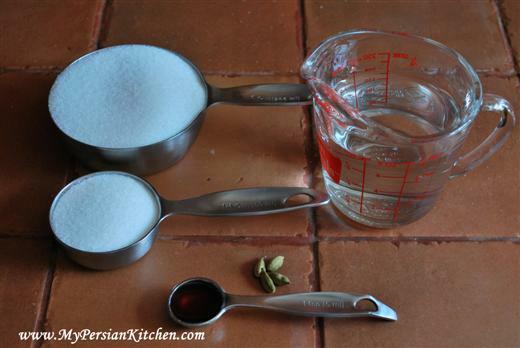 In the mean time make a simple syrup by boiling sugar, water, and crushed cardamom pods together in a sauce pan until sugar is dissolved. Add vanilla and let reduce for about 15-20 minutes. Cover the sauce pan to keep the syrup warm for the next step. Rinse eggplants and dry with a paper towel. 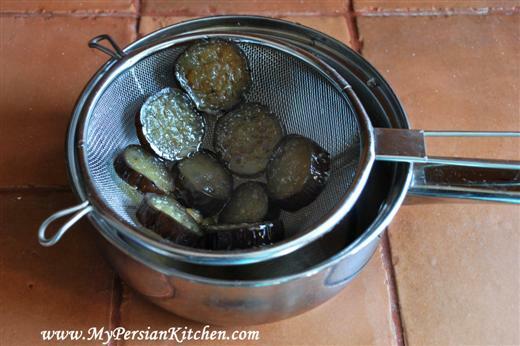 Place eggplants in the syrup sauce pan, cover and let sit for 2 hours. Heat milk until almost to boiling point. Remove from heat and add vanilla. 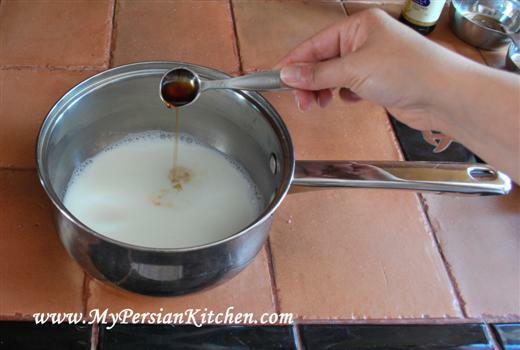 Slowly pour warm milk drop by drop in the egg and sugar mixture while whisking. 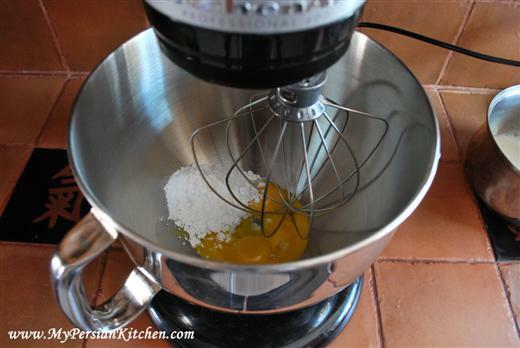 Be patient you don’t want to cook the egg yolks as you will then have to start all over. Rinse sauce pan in cold water and place custard back in the sauce pan. Add nutmeg. 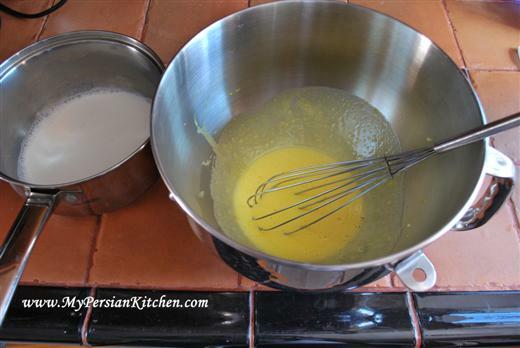 Whisk the custard constantly, with a whisk or spoon, on low heat until the custard thickens. Make sure that you don’t cook the yolks. 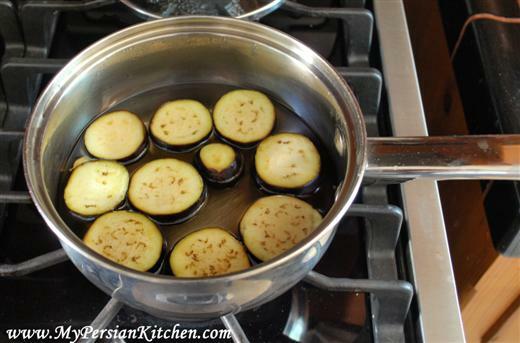 Also simmer the eggplants in the syrup for about 15 minutes making sure that each slice turns into a dark color. If the eggplants stay white, then with a fork submerge them. Remove from heat, cover and let rest over night. 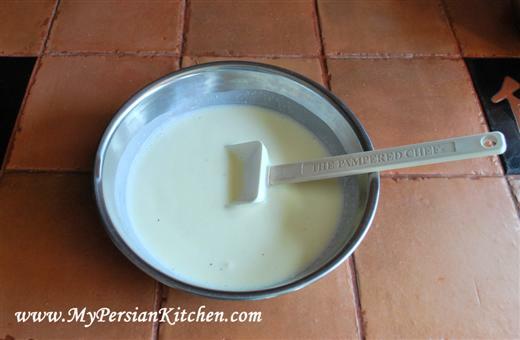 The custard will be ready when it thickens and also when is thick enough to coat the back of a spoon. 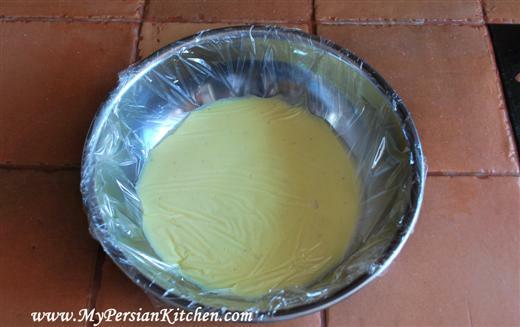 Strain custard in a bowl. 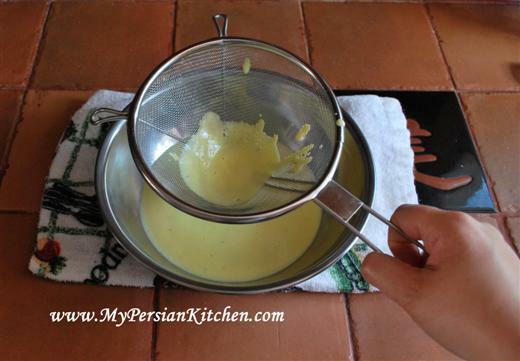 I always like to strain my custards. Cover custard with plastic wrap making sure that the plastic touches the custard. Once cool, place in the fridge and let rest over night. When you are ready to freeze the custard, completely drain eggplant slices. 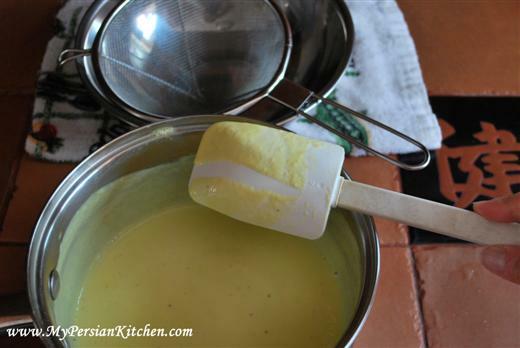 Add heavy cream to the custard and mix well. 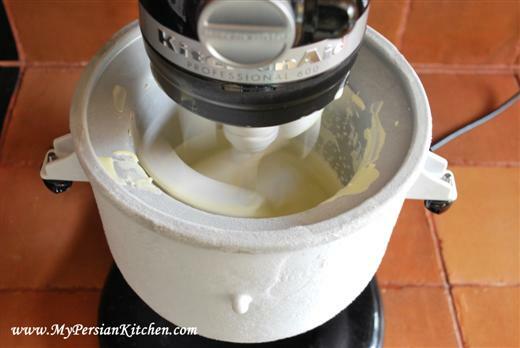 Freeze custard in the ice cream maker. In the mean time dice eggplant slices. 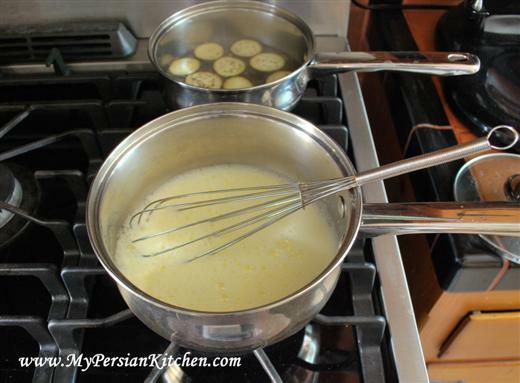 Add eggplant to custard just when it begins to freeze and take a solid shape. Place in an airtight container for at least 20 minutes in the freezer before serving. And there you have it! A delicious ice cream. I opted to let everything rest over night to allow the flavors to come together. I have found that this really adds more flavor to the ice cream. The custard has a nice nutmegy flavor while the eggplant pieces are sweet with a nice hint of cardamom. This ice cream will really surprise you at how good it is! Very interesting, and nicely photographed. I will have to try it. I have a Persian friend who makes a lentil salad. She keeps promising me the recipe. Any you might share? Ed, thank for the comment! Lentil Salad, nop, I have never made one. But I suppose I could work on making one and post it! So creative and fun. I must admit I’ve never had much luck making homemade custards. Yours look like it turned out great! Wow, I’m impressed-you have actually made this look very appetizing! I would try it-but I’m not usually good with desserts:( how long did it take? I have a good lentil salad recipe if you’d like, by the way. @ Bria, custard is tricky, you totally have to be patient about it. I have had to restart mine a good few times. 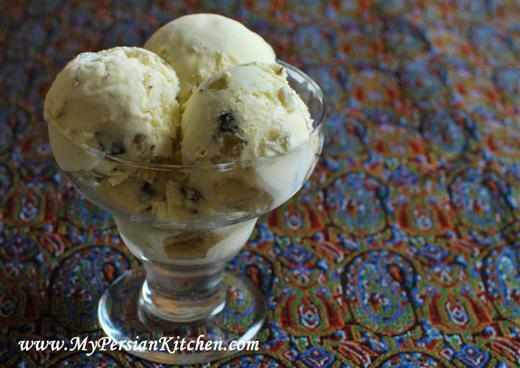 Actually, the first time I made this ice cream I had to redo my custard! It’s all about a low flame and staying on top of it! @ Mina, Well it took a bit of preparation but it wasn’t too overwhelming. I chose to have everything rest over night so that added to the overall time. well, I’m going to ask the most stupid question, but it has to be done! so – does this actually taste like eggplant? I mean, eggplant as we know it – or does the flavour somehow change? as a fellow eggplant addict I’m intrigued! Good question Olivia! The eggplant adds texture to the ice cream. 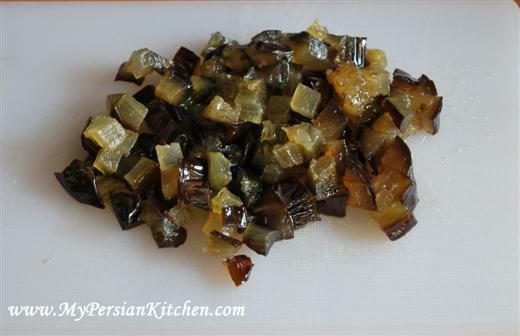 But it also taste sweet with a hint of cardamom because the eggplant is cooked and marinated in the syrup. It’s not like eating eggplant per se, but it’s just very different. Though I make egglpant spoon sweet and eggplant-chocolate cake, I never thought about using it in ice cream. Very tempting idea! History of Greek Food, please do try this recipe! Amazing! This icecream I have to try. I neverever thought of an icecream made from aubergines. Thank you for sharing the recipe with us. Sandra, you are welcome! Let me know what you think of it when you make it!! My friend Sandra told me about your ice cream recipe and that we should try it at our cooking club. My reaction was, yes I am always looking for something new and exciting when it comes to food, especially with eggplant my favourite vegetable. But I must say that I was not expecting it to taste as great as it did. Well yesterday we made it. The cardamom flavour was beautiful and the sweetness of the eggplant was superb. I will definately make this again. Hilda, I am so happy your tried this recipe!! The flavor is really good and definitely not what you expect when you hear eggplant ice cream!! I absolutely agree with Hilda about the taste. The flavour of cardamom reminds me a bit of the Indian ice cream “Kulfi”. But all of us, Cooking Club Ladies, were surprised and liked it very much. Sandra, thank you for our comment. I love the fact that you this ice cream was made for your cooking club, as I made it for my cooking club!!! Thanks for sharing your eggplant ice cream receipe with my friend Sandra, I was a little shocked when she revealed what was inside the ice-cream, but it was truely delicious. Anne, I am so happy so many of you are enjoying this ice cream! It makes me so happy!!! Grace, thank you for your comment! I am so happy that so many of you have enjoyed this recipe! I am so glad I not only made it in the first place but also decided to post it! 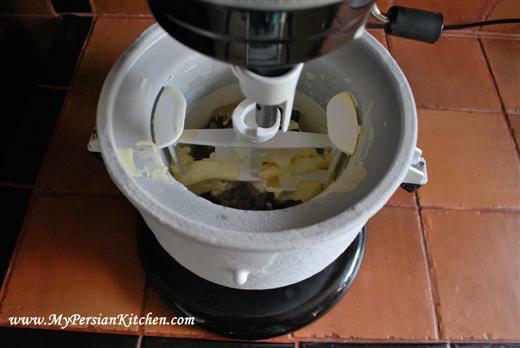 Eggplant Icecream, I was totally suprised, I will give it a try and let my persian friends in Bahrain try and eat it, coz I am ellergic to eggplant ! I’ haven’t seen eggplant ice cream. I think ıt was delicious. In Türkiye we have eggplant jam, I’d like towrite your blog is very beautiful. We have some similar dishes. Thank you for sharing your recipes step by step with us. Hayırlı Ramazanlar.